A while back I posted the start of this self-portrait and between projects I have been returning and returning to the drawing to refine it as best I can. I was strongly motivated to get it as accurate as possible before painting. Doing a self-portrait from life is a far greater challenge than doing it from a photograph and harder than doing a portrait of another person. It is cheaper than paying a model and that’s the big plus. I have gotten advice from my friend Eric Manella an excellent painter and teacher from Montreal (See Four Amigos post for more about Eric and his Atelier de Bresoles). 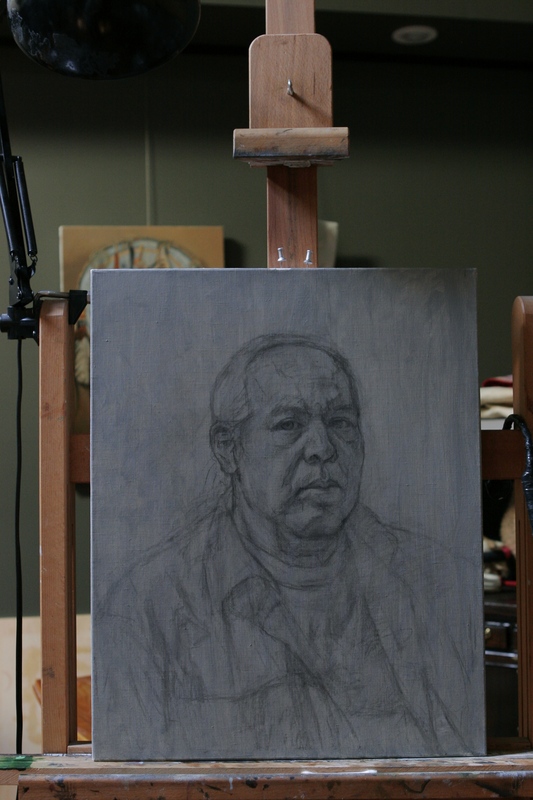 I am feeling I am getting to the point where I will begin the painting process now for this old-school selfie. Stay tuned. Meantime the Four Amigos (maybe 3 of the 4) will be gathering again on Tuesday coming for another session with our model Tuki Loft. I will post our progress when we are done for the day. Thanks for looking! Niawen kowa Kayeri. I am trying to push myself to keep growing in my skill. As you can see I have recently begun to have the opportunity to paint alongside some wonderfully talented fellow artists.